Tagline: It will live in your heart forever! While the story of Peter Pan has been told and retold many times over the years, I really think that Disney's version is the most entertaining. To be frank, I don't know how faithfully it represents J. M. Barrie's original play, but I really don't care; Disney's Peter Pan offers an absolutely delightful and charming rendition of the tale. Although the 1940s generally has been regarded as Disney's "Golden Age" - with the appearance of classics like Pinocchio, Fantasia, Dumbo and Bambi - I really think the 1950s were a much more productive decade for the studio. For one, all of those "classics" were bunched tightly together in the first few years of the decade. Disney released nothing highly regarded after 1942's Bambi and only issued "meat and potatoes" (Walt's phrase) cartoons like The Three Caballeros and Make Mine Music until returning to form with Cinderella in 1950. To be honest, I'm not all that fond of many of those alleged classics of the 1940s. I love Pinocchio and Dumbo is also a lot of fun, but the other two aren't all that great. The animation is well-drawn and executed, but I've always found significant portions of Bambi and Fantasia to be rather uninteresting. Ultimately, I think the films are good but not terribly fascinating. The same is not true for Disney's offerings in the next decade. Starting with the wonderful Cinderella in 1950, Disney released a string of winners that remained unbroken all the way through 1961's 101 Dalmatians. Alice In Wonderland , Peter Pan, Lady and the Tramp and Sleeping Beauty make for an imposing roster of films. While some of the animation may not be as stellar as that seen during the studio's earlier efforts, these movies are still impeccably executed and they're simply a great deal more entertaining. Such stiff competition actually means that Peter Pan may only rank third with me for the decade (after Tramp and Alice), though it may be unfair to rank them; they're all bunched together so tightly that ratings seem arbitrary. In any case, Peter Pan makes for a terrifically enchanting film. Rarely has Disney conveyed a sense of magic as wonderfully as we see here; the scene in which the children learn to fly is absolutely thrilling and charming all at the same time, and it conveys a sense of wonder that's a thing to behold. One difference between the Disney films of the 1940s and 1950s is that the studio seemed more willing to vary the comedy in the second decade. Styles in Pan run the gamut, from cuteness and charm through some wild slapstick. Most of the latter occurs due to the wild presence of Captain Hook, one of the best villains in the Disney roster. No, he's not nearly as scary as Malificent or the Queen in Snow White and the Seven Dwarfs (still probably Disney's most frightening baddie). 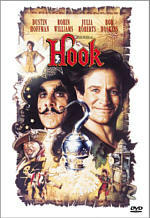 Actually, Hook isn't too scary at all, since he never seems like much of a threat against the near omnipotence of Pan. Nonetheless, Hook's so tremendously entertaining that I didn't mind his less than ominous personality, which is in keeping with the path Disney started to take at that time. After a traditionally nasty villain in Cinderella, the baddies got more comic in Alice with the blustering Queen of Hearts. Hook followed in a similar vein, one that would come to include characters such as Cruella DeVil in 101 Dalmatians and Madame Mim in The Sword in the Stone. Hook's my favorite of that more comic bunch. Hans Conried offers a stellar performance as the Captain. He brings him to life with delightful wit and charm and helps make our vengeful Captain a thorough delight. Peter Pan isn't a perfect film; it can drag a little at times - especially when Hook's not onscreen - and to call its portrayal of the Indians as less-than-politically-correct would be an understatement. Nonetheless, it's still terrifically entertaining, and mixes broad humor with touching sentiment easily and convincingly. 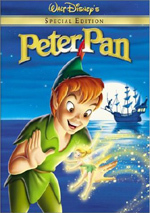 Peter Pan appears in an aspect ratio of 1.33:1 on this single-sided, double-layered DVD; the image has not been enhanced for 16X9 televisions. Although it's not perfect, this picture offers yet another terrific image for a Disney animated film. Sharpness generally seemed quite good, with a picture that usually looked very crisp and well-defined. At times, some very gentle softness interfered with the detail, but it's vague and not much of a problem. I detected no jagged edges or moiré effects, and the print used appeared nearly spotless. I saw a mark at one point during the Skull Island scene, and a couple of speckles turned up around the same time, but otherwise this was a clean presentation. Colors seemed quite brilliant and vibrant. Peter Pan made wonderful use of a variety of hues, and they all appeared accurately and cleanly replicated on this DVD. Black levels were deep and rich, and shadow detail appeared appropriately dense but not overly so. At times characters looked a little bright, so contrast wasn’t always the greatest, but those problems occurred infrequently. In a nutshell, Peter Pan presented a pretty terrific picture, especially given the age of the source material. From what I could tell, the image of Peter Pan replicated the same one found on the old DVD. However, the Dolby Digital 5.1 soundtrack apparently differed from what we heard on the original release. That one included a Dolby Digital 4.0 mix. Though the 5.1 track didn’t seem to open up the soundfield to a substantial degree, I thought it provided a more satisfying auditory experience nonetheless. In regard to that soundfield, to a large degree it reflected the monaural origins of the material. Much of the sound remained anchored in the center channel. Music spread decently well to the sides, and the score also occasionally blended with the surrounds as well. Stereo separation seemed weak, however, as the imagery tended to appear vague and without great distinction. As for effects and speech, they almost never left the center; the other four speakers were reserved almost exclusively for the music. That aspect of the new mix seemed identical to the old one, though the 5.1 Pan offered one improvement. For the 4.0 track, I noticed occasional bleeding of speech from the center to the sides, but that didn’t seem to occur on the new disc. Though the music remained ill-defined, at least I heard none of the sloppiness that marginally marred the old package. The new track also appeared to present somewhat stronger audio quality. Due to the age of the material, there was only so much that could be done with it, but I felt that speech sounded cleaner and more accurate this time. I felt the old track showed some roughness in regard to dialogue. While speech in the new mix seemed a bit thin and flat, the lines came across as easily intelligible and free from edginess, so they demonstrated improvements. Music still was fairly lackluster, however. The score and songs appeared clear and bright, but they offered virtually no low-end response. Effects demonstrated a little oomph at times, though. For example, cannon fire showed decent bass, and some moderate depth always accompanied the appearance of the crocodile. A bomb blast at the end of the movie actually rocked my subwoofer to a surprising degree. Those elements also seemed reasonably clear and accurate, with no distortion or obvious flaws. The mix lacked any other source defects and sounded nicely clean across the board. While the audio of Peter Pan remained dated, it nonetheless appeared to show improvements over the earlier track. This new special edition DVD of Peter Pan supplants an out-of-print version that included absolutely no extras. While not a packed package, the new Pan does provide a few nice pieces. It mixes components ported over from a 1998 laserdisc release with some new materials. We start with an audio commentary hosted by Disney animation executive - and Walt’s nephew - Roy Disney and film historian Jeff Kurtti; the former leads roughly the first half of the flick, while the latter takes over for much of the second segment before Roy returns. This tracks includes remarks from Walt himself, Disney animators Ward Kimball, Ollie Johnston, Frank Thomas and the late Marc Davis as well as film historians Leonard Maltin and John Canemaker, live-action model for Tinkerbell Margaret Kerry, and live-action model and voice performer Kathryn Beaumont. While Johnston and Thomas were recorded together, everyone else appeared to have been taped separately for this edited, semi-screen specific track. Most of the comments seem to come from the same sessions that appear during the “You Can Fly” documentary discussed below, though not many of the speakers repeat information. Overall, this is an interesting commentary. I can’t call it an excellent piece, but it does offer a fair amount of useful information. The track starts slowly; during the first few minutes we hear little more than generic praise for the flick, and I feared that the whole thing would offer little more than a fluffy puff piece. Happily, it quickly improves, and the combination of historical perspective with notes from actual participants means that we get a nice spectrum of material. Not surprisingly, the animators’ notes are best, especially when we hear from Johnston and Thomas; they add a lot of depth to the piece. Again, Pan doesn’t provide a great track, but it’s definitely worth a listen. Next we find a documentary called You Can Fly: The Making of Peter Pan. This 16-minute program originally appeared on the 1998 laserdisc, and it includes then-recent interviews with Beaumont, Thomas, Davis, Kerry, and Maltin. 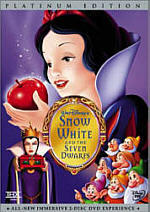 The program also provides some film clips, shots of Walt Disney on TV, production stills and artwork created for Pan. Though brief, the piece runs the whole history of Pan, from its written origins through prior film versions and the production of the Disney version. It also gives us a look at work done for a planned earlier Disney edition of Pan which had a darker tone, and we hear parts of an unused song as well. Again, the program is too short to be tremendously worthwhile, but it still packs a lot of good details into its running time. Less compelling is The Peter Pan Story, a featurette from the period of the film’s original theatrical release. This 12-minute piece existed solely to promote the movie, and it was given to TV stations free of charge if they’d air it. It begins with a long and tedious introduction about the history of storytelling; it takes us 1/4th of the program before we actually get to Pan! After that, we learn a little about author J.M. Barrie, and there’s a good look at a storyreel for the film, but overall the show is slow-moving and fairly uninformative. The last few minutes mainly show scenes from the movie. Overall, “Story” is more interesting than many modern promotional featurettes, but it still lacks much depth. The same goes for An Exclusive Look At Walt Disney’s Return to Neverland. This two-minute clip essentially is nothing more than a trailer. Presented fullframe with Dolby Digital 5.1 sound, it shows us bits and pieces of Neverland and virtually nothing else. Yawn. In the Peter Pan Still Frame Gallery we find a nice collection of thumbnailed works. These appear under a few different subheadings. “Abandoned Concepts” includes six drawings, while we get 23 frames of “Character Development” (including one that makes Tinkerbell look like Wilma Flintstone). “Visual Development” provides another 33 images, which gives us a grand total of 62 stills. We already saw some of the material during the documentary, but a lot of it was new, and it’s nice to get it all presented in such a convenient manner nonetheless. A few other Disney DVD stand-bys round out the package. We find a Sing-Along Song for “Following the Leader” as well as a storybook telling of “Peter’s Playful Prank”. As usual, the latter can be viewed with or without narrated accompaniment. Obviously meant for the little ones, they should enjoy it. A Pirate Treasure Hunt Game appears next. This combines some very easy trivia with the usual pointless guessing contests. In between the tasks, we learn a little information about pirates. Unfortunately, successful completion of the game results in no prize. In fact, once you finish, it just returns you to the “Special Features” menu screen; you don’t even get a “congratulations” message! When you start the DVD, you’ll find ads for some other Disney flicks. There’s a promo for the hotly anticipated DVD video release of Beauty and the Beast. The trailer highlights the inclusion of “Human Again”, the song added for the IMAX theatrical release of Beauty. In addition, the DVD opens with promos for Cinderella II: Dreams Come True, The Hunchback of Notre Dame II, The Many Adventures of Winnie the Pooh, and Disney DVD as a whole. These clips also can be found in the Sneak Peeks area alongside additional ads for Tarzan and Jane, 101 Dalmatians II: Patch’s London Adventure, and “Magic Happens”, a fairly sappy promo that reminds us how magical Disney is. Finally, Disc One includes some DVD-ROM content, but not much. All we find are some Weblinks. You can “register” your DVD, which then qualifies you for Disney’s disc replacement program. You can also enter a sweepstakes - when they offer one, that is, for currently (February 14, 2002) they’re running none. 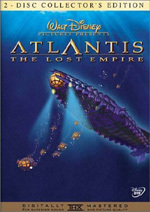 This section offers connections to “Disney’s Movie Finder” - a page that offers information about pretty much every Disney flick ever - as well as go to the Disney DVD site. It’s a pretty blah collection of links. As noted, some of these pieces come from a 1998 laserdisc. A few - like the audio commentary - are new to the DVD, but this package omits some of the LD’s pieces. We lose some sound recordings of storyboard presentations, and the LD included a larger collection of still frame materials. After almost 50 years, Peter Pan remains one of Disney’s top animated films. The movie suffers from some dated elements, but overall it holds up well and remains a charming and delightful piece of work. The DVD offers an image that shows few signs of age along with sound that betters the audio from the prior release. In addition, we also find a nice little collection of extras that help make this a more compelling package when compared with the 1999 release. While not one of Disney’s top DVDs, Peter Pan still provides a fine set that belongs in the collection of any animation fan.